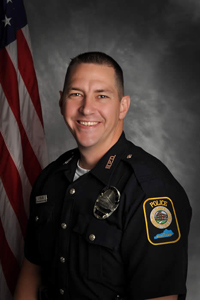 Jason joined the joined the Bardstown Police Department as a Police Officer in 2006. In less than three years, Officer Ellis received Governor’s Awards for Impaired Driving Enforcement in 2007 and 2008 and was awarded Officer of the Year in 2008. He also became the Department’s only canine officer in 2008 when he partnered up with a German Shepard, Figo. He further served his community as a youth baseball coach. At 1:59 a.m. on May 25, 2013, after a late arrest and having put his prisoner in the Bardstown jail, Officer Ellis secured his tour of duty on second shift and headed home to Bloomfield. He did not have Figo with him at the time and was operating a pool car. As such, he did not have a camera mounted on the dash. About 2:30 a.m., as he left the Blue Grass Highway on Exit 34, he found the ramp blocked with tree limbs. He turned on his overhead lights, turned the patrol car to block the ramp, and began clearing the limbs. With several cradled in his arms, shotgun blasts rang out from the embankment. Pellets tore into Officer Ellis’s arm, side, neck, head, and other areas not protected by his ballistic vest. He fell to the ground, among the limbs he was carrying. Soon afterwards, a woman drove her Toyota off the highway and up to the patrol car. She stopped and waited. At 2:36 a.m., Chad Monroe, a distillery worker, came up behind the Corolla, got out, spoke to the woman, and then went to help the officer pick up limbs. When he saw Officer Ellis on the ground in a pool of blood, he ran back and told the driver of the Corolla to call the police and then went back to render whatever aid he could. At 2:40 a.m., the woman entered Officer Ellis’s cruiser and called for help on his radio, reporting that the officer had been involved in an accident and she though he was dead. Kentucky State Trooper Mike Garyantes responded and determined that he had been shot. Nelson County Coroner Rayfield Houghlin later said Ellis was shot “multiple times” with a 12-gauge shotgun. His service weapon was still in its holster. About 11 a.m., fifty cars from multiple agencies escorted his body from the scene to the Kentucky Medical Examiner in the Jefferson County Government Building in Louisville, Kentucky and the Kentucky State. Police Officer Ellis was survived by his wife, Amy Ellis (nee Phillips); two sons, Hunter Ellis (5) and Parker Ellis (4); mother; two sisters, Kelly (Andy) Eastman and Lacey (Brandon) Young; and seven nieces and nephews. His brother in-law, Nathan Phillips, was also a Bardstown police officer. His funeral service was held at 11:00 a.m., May 30, 2013 at Parkway Baptist Church of Bardstown. Being the only Bardstown Police Officer killed in the line of duty, hundreds of Bardstown citizens and interstate police officers lined the procession route. He was buried at Highview Cemetery, Chaplin, Kentucky. 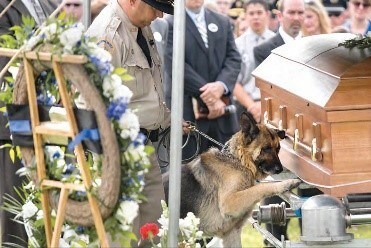 During the final service, Figo, his husky Canine partner, laid his paw on the casket. Kentucky State Police conducted, and continue to conduct the investigation into his death. Initially, investigators believe Officer Ellis, while on his way home, stopped to assist a motorist and was murdered. By then end of May 25th, it was ascertained that the trajectory of the bullets placed the shooter on a hill above the exit. It was then believed that Ellis stopped to move debris from the roadway and was “ambushed,” the coroner’s office said. By May 29, 2013, Bardstown Police Chief Rick McCubben went public with, “We believe that he was the target,” McCubbin said, because “this was methodical, precise, planned and executed in a perfect fashion, unfortunately.” The debris that Officer Ellis removed was tree limbs from a tree not indigenous to the area, so it was likely brought there for the purpose of setting up the ambush. On June 2, 2013 Jeff Ruby, the owner of multiple high-end restaurants, posted a $33,000 reward for information leading to the arrest and conviction of Officer Ellis’s murderer. That posting brought the total to $100,000. By November 2017, the total reward had elevated to $200,000. By June 18, 2013, with still no solid evidence to go on, Kentucky State Police established an email hotline, EllisCaseEtips@ky.gov, set up at KSP Post 4 for any information regarding the incident, tree trimmings in Nelson County, etc. As of January 2014, the reward for identifying Officer Ellis’s murderer has grown to a quarter of a million dollars. But on the first anniversary of this death, there have been no advances in the case. After Officer Ellis’s murder, there have been two bills introduced into the Kentucky State legislature referencing him: one, to name a stretch of the Blue Grass Highway after him; and another to establish minimum penalties for the murder of police officers in Kentucky. On May 11, 2017, near the 4th anniversary, Kentucky State Police hired two retired troopers to focus on the Ellis case and a handful of other unsolved murders in the Bardstown area. There have still been no arrests. Figo was retired one year after the ambush and given to the family. On May 23, 2017, Figo passed away at his home two days before the 4th anniversary of his master’s death. Bardstown Police Chief Steve Uram and Chaplain Tom Mobley sponsored a memorial to Figo June 9, 2017. His remains were buried near Officer Ellis’s at the High View Cemetery. This narrative was updated May 26, 2018 by Cincinnati Police Lieutenant Stephen R. Kramer (Retired), Greater Cincinnati Police Museum Memorial Committee Chairman. All rights are reserved to him and the Greater Cincinnati Museum.